Yesterday my super cheap ex-boyfriend told me that I would be proud of him. I asked him why and he told me that he will be staying in Washington DC hotels for free for three nights. I asked him how he managed that and he told me about the Best Rate Guarantee from Wyndham hotels. Wyndham is a company that owns thousands of hotels and motels around the world. These hotels include the brands of Ramada, Howard Johnson, Baymont Inn & Suites, Super 8, Days Inn, Wingate by Wyndham, Knights Inn, AmeriHostInn, and Travelodge.Its Best Rate Guarantee (BRG for short) basically lets you stay for free for one night if you find a rate for their hotels that is lower than the price on Wyndham's site. 1) You must find a publicly available rate for a specific Wyndham hotel that is lower than Wyndham's posted rate for the same hotel. 2) The room type for the rate you find must match the room type on the Wyndham site. 3) You must book your reservation through one of Wyndham's hotel sites. 4) You must notify Wyndham of your claim within 24 hours of making the reservation and your reservation cannot be booked within 72 hours of arrival. 5) Only the first night is free for each eligible stay. More detailed terms and conditions are available here at Wyndham's site and a claim form is also available. Of course, the secret sauce to taking advantage of the guarantee is finding the cheaper posted rates. You can look through sites like Kayak , Hotels.com , Expedia or HotelsCombined , but it could take time to find a cheaper rate for the hotel you are interested in. Fortunately, there is a great website called The Best Rate Guarantee Blog that posts many of these rates almost daily. 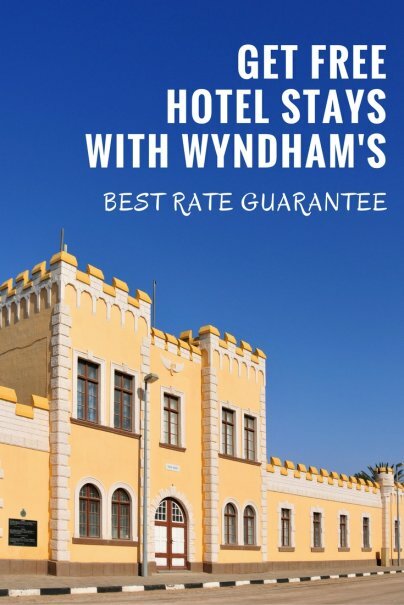 Sometimes the competitor rates are only 99 cents cheaper than Wyndham's rates, but the guarantee is still honored and the customer gets a free night. When you plan well like the Frugal Travel Guy , you could get an entire vacation's hotel stays for free. You could also move around different Wyndham properties in the same city and get multiple nights for free. For example, the super cheap ex-boyfriend actually found three lower rates for three different hotels in the DC area and that is why he is getting three nights free. I am not sure how long this guarantee will last, but while it is here you could save hundreds of dollars on your travels just by finding a better price online! I really want people to know that the Wyndam Resort in Orlando on International drive is absolutely awful. DO NOT STAY THERE! The rooms are not clean and They smell musty and moldy. Also the TV's do not work most of the time. THey are scam artists with scam artists working in the lobby trying to get you to go to a bs time share so called "breakfast" for discounted Disney tickets...If you have 3 hours to waste and are willing to argue with people that can't take NO for an answer go ahead and stay there. IT is a scam! On a trip to Atlantic City, we were duped and scamed by Wyndham Vacation Resorts representatives into buying "points" for vacations. We said no at first, but after 3 hours of basically "grilling" we relented and took a cheap points package. From that point on we were again advised to "upgrade" so we could have more points and own more "property" and then again we were advised to do so again. We now own four contracts when we were promised that each time we upgraded we would only have one payment per month plus one maintenance fee. These people do not return calls and have cost us thousands of dollars that we can ill afford to lose. Now I am about to seek legal advise and have written the state attorney general several times. PLEASE PLEASE PLEASE do not ever deal with theses people, they have no feelings, no heart. I too feel that Wyndham resorts and anyone involved with them , ie trendwest are legal scammers. My husband and myself have been caught by their finance division after attending a lengthy and hounding sales pitch. After realising the pit they have put my family in, I have researched and found others like yourself that feel the same. Any advice, I am willing to join you to fight against this injustice!